• JSA #37 "Stealing Thunder!" 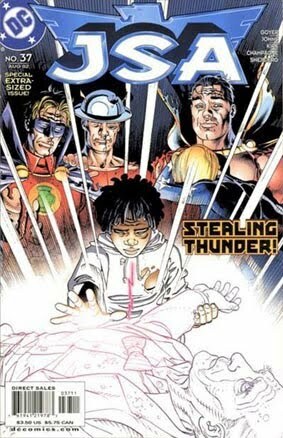 • PLOT SUMMARY: An extra-sized issue features the dramatic conclusion to the 5-part "Stealing Thunder!" Johnny Thunder has caught the wrong end of a Marvel-ous fury, and the world must cope with the repercussions of Ultra-Humanite's mad dream. The JSA learns the hard way that to stop the Ultra-Humanite, the ultimate price must be paid. Plus, an 8-page backup story starring the new Crimson Avenger, drawn by Peter Snejbjerg (STARMAN)!